Fathom Events announced a new partnership with Cirque du Soleil this week, which will bring the internationally acclaimed “KURIOS – Cabinet of Curiosities” show to cinemas across the country. The special one night theatrical event will be presented in hundreds of movie theaters nationwide featuring an exclusive introduction short film from Cirque du Soleil. 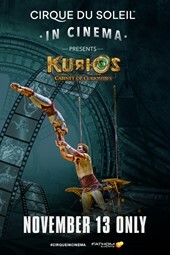 “KURIOS – Cabinet of Curiosities”, an internationally acclaimed show presented under the Big Top since 2014, follows the ‘Seeker,’ who becomes convinced that a fantastical, invisible dimension exists in another realm, in which all life’s most unbelievable possibilities are lying in wait. As this world merges with reality, a parade of otherworldly characters suddenly steps into the spotlight, bringing the Seeker’s imagined realm into being.